Shut down the forums, the best post has already been made. 112) I want a Uhura Karma skin, who do I have to bribe around here to get that done? Lol, you should become a famous writer. 113) Will there be an exclusive MacLaren skin for Anivia? If so, I highly suggest Q, W, E, & R be different variations of Ice-walls for quadruple the epic-ness. 114) When will we see a Red Mage Veigar? He better get healing spells, because White Mage Veigar still lacks them. 115) Is someone going to ever give Morgana the rest of her dress? I mean really, she looks like a clown-***** with the dress-skirt-minus-the-dress-thing. 116) Is anyone going to tell Sam Fisher that Master Yi stole his night-vision goggles? He's been pissed off for the last few Splinter Cell titles, and I think he wants them back. 117) If Akali is going to get away with using farming tools as weapons, can we get a ninja who beats the **** out of someone with a shovel or a rake, please? No scythes though, that's too cliché. 118) Why hasn't Twisted Fate used his super-cards to play a sadistic, bloody game of 52 card pick up yet? 119) When will we get Hitlerdinger? Fan-service, please. 120) Has Sivir ever failed to catch her cross? 120a) If so, did it continue to go on an infinite trek, shredding everything in its path for eternity? 121) Does Shen or Akali ever feel embarrassed about having a squirrel (Kennen) as a disciple in their ninja crew? 122) Was Ezreal designed to be something only fat anime fangirls would find attractive? 123) Was Evelynn designed to be something only fat male perverts would find attractive? 124) Was Annie designed to be something only fat elderly asian men would find attractive? Oops, topical! 125) What's wrong with Urgot's face? SERIOUSLY! He plays it one card at a time. 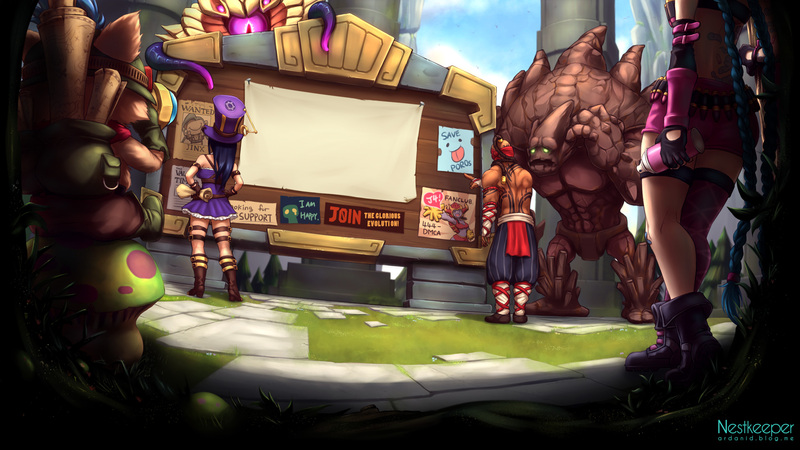 As the five fighters stepped out onto the field of Summoner's Rift, it looked like this would be a game like any other. Their fifth summoner had finally settled on Anivia, having cited a "really pro guide" as the inspiration for his choice. This worried their team slightly, and Anivia herself looked the most disconsolate of them all. Yes, a game like any other. "Who are we up against?" asked Teemo. "I wasn't paying attention." Xin rattled off the names of the enemy champions like he was reading an inventory list. Urgot. Soraka. Corki. Tristana. Ashe. "My one consolation this round will be that their Soraka is trying to jungle." "Heh. Stupid *****." Xin said, grinning. "Alright, where's everyone going?" Garen claimed the top lane just as Mordekaiser claimed bottom. Morde then quickly redacted his answer and moved to stand next to Garen. Xin raised an eyebrow. 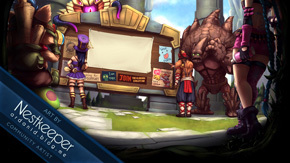 "We're testing a new strategy, Xin." Garen said. "Don't worry about it." "Right, whatever. Teemo, you're center." Anivia sighed, "My summoner is screaming that I need to go center. Teemo, do you mind? Teemo?" The four looked around. Teemo was nowhere to be seen. Xin swung his foot at a gap in their formation, and the little yordle fell out of the air. "S-sorry!" he said, scrambling to his feet. "You heard the plan, right?" Teemo nodded. Everyone already knew he was lying. The announcer welcomed the fighters to Summoner's Rift, and Garen offered to go top and see who they would be fighting. Mordekaiser followed him, and within seconds they were in position. Garen eyed a patch of brush near their tower. "Hey, Morde." he said, gesturing. Mordekaiser looked towards the bush, "You're serious? Now?" "**** right, we have plenty of time until the match starts." "If I must." Morde joked, and the two entered the shrub together. As soon as they were out of sight, the two began to remove their leggings. The thrill of what they were doing gave Garen a powerful adrenaline surge, and he practically forced Morde into the dirt. A few minutes after they'd begun, Garen heard a rustling in the bush behind him. He spun around, startled. There, standing completely paralyzed, was Teemo. Morde turned his head to see. "What have I told you about facechecking bushes?" The yordle had vanished, but Garen knew he was still utterly transfixed. "Morde here didn't learn his lesson, either." Teemo emitted a tiny yelp of terror and bolted from the bush, hopefully headed towards center lane. This would be good for him, Garen thought. "Minions have spawned!" called the announcer. Me too, Garen thought as he strode out of the bush with Morde in tow. He looked out past his tower and saw Corki idling impatiently, waiting for the minions to arrive. "Oh, there ya'll were! I was gettin' concerned." yelled Corki. "...What were ya doin' in that bush, anyhow?" Corki guffawed, "That's wh--" his expression changed from bemusement to confusion as he realized Garen might not have been kidding. "I ah... uhm." "Your turn. DEMACIAAAA!" Garen howled as he charged past his tower straight at the pilot. Corki panicked, unloading his chaingun toward the Demacian, then turning around and spraying bullets at his own minion wave. "Taaarnation!" Corki yelled. As Corki flew past his own tower, Garen called off his assault, stopping long enough for the ponderously-paced Mordekaiser to catch up to him. Garen smirked. What sort of ****** takes chaingun first? This would be easy. Mordekaiser leaned forward, fighting to catch his breath. "Don't... run so... fast." he said between labored breaths. "Maybe you should start with boots, Morde." Garen suggested. Morde nodded in response. The minions stormed past their respective towers and met in the middle for their grand melee. Garen waded through the battle like an instructor watching over practicing students. His sword would occasionally dive into the sea of purple and blue to end their lessons and take his payment. Corki had finally returned, and Garen heard the voice of his summoner on the wind. Garen looked at Mordekaiser. His summoner also wanted blood. They shared a silent nod and dove on the unsuspecting pilot. Garen's blade tore a great gap in the side of the fuselage, causing a spray of oil to burst from a ruptured pipe. Mordekaiser's enormous mace met the front of Corki's vehicle with a thunderous crash. Suddenly, Corki and his vehicle erupted in a surge of green light, and their work was undone. "You have heal?" Garen said, exasperated." "I... I don't wanna talk about it!" said Corki as he tugged hard on a lever in the cockpit and attempted to flee. Seeing this, Mordekaiser swung his mace with devastating force and obliterated a number of tiny minions who had suddenly come between he and his target. Corki's chopper also suffered a grievous hit from the shockwave, but it was too little, too late. Corki parked near his tower and was sudenly surrounded by coruscating blue circles. He was resting his head on one arm, and wore an expression that told Garen he was considering flying out of the arena and going home. Now that Garen and Morde were free of Corki, the two began their grisly work of harvesting the little minions who stood between them and the tower. In seconds, the minions were destroyed, and Garen began hacking away at the solid stone of the tower as it frantically tried to destroy the enormous minion wave, one target at a time. Suddenly, he felt a slicing pain in his back, and he turned to see Soraka. She was orbited by four red squares, and Garen felt his injury burning into his back. He started towards her, and so did Mordekaiser. She ran. "How did she manage to get red buff?" Garen asked, or more accurately, shouted. Mordekaiser shrugged, an anormous shrug that was almost comical to behold. Soraka stopped and turned, "What did you just call--" she was cut short when garen leapt on her and began to slam his fists hard into her face. "This! Is! For! Every! Time! I've! Died! To! Warwick!" Garen punctuated every blow. He felt Mordekaiser's hand gently fall on his shoulder. Garen looked back at the fallen Starchild and confirmed that she was, in fact, very dead. "First blood!" the announcer shouted in jubilation. "Real difficult, Garen. Good job." Garen heard Xin shout sarcastically from across the map. Garen stood. The Demacian code demanded that warriors take no satisfaction in beating on those weaker than they, but Garen didn't have to tell anyone. He hated everyone on that team. Garen had resumed pounding away at the tower when he heard it. "Your turret has been destroyed." "What in the god**** ****ing--?" Garen started, when he heard Xin howling his rage to the heavens. "You boys got some good defense, there!" yelled Urgot. "Or... ya did. Heh." The next thing Garen knew, he was racing down the river, furious footsteps crashing into the water with the force of sledgehammers. He wasn't sure who to kill first, Urgot or Teemo. He managed to collect himself enough to take cover in the bushes rather than charge into the center lane and tear off Urgot's flesh with his teeth. An unattractive prospect, normally, but Garen was pissed. He looked down the lane, past his ruined tower, to see Teemo frantically trying to clean up the minions who were now working on destroying the second one. He looked up the lane and saw another wave of minions incoming, but no Urgot. He heard a noise behind him, spun, and ducked just in time to avoid a bladed missile hitting him in the face. "Teemo!" Garen yelled, "Call god**** MIAs!" Teemo took his lips from his blowgun just long enough to respond in ragged breaths, "I-I'm sorry! I'm sorry!" he looked to be on the verge of tears, and Garen for an instant felt a pang of sympathy for the little scrub. As his eyes fell on the ruins of his tower, though, his rage was reignited. He turned to face his attacker, and there, on the ledge, was Urgot. He was wearing what appeared to be a southern Baptist's attire, and had a long piece of straw clenched between his malformed teeth. "What the hell are you wearing, fatass?" "'S called a costum'. Had it all along, jess never had occasion ta wear it." he replied. He used his pincered arm to take the straw from his mouth. "That was a right fancy dodge, city boy. See if you can do it agin'." "Would one of ya'll mind a-HELPIN' ME?" An explosion in the distance. Over a cluster of trees flew Tristana, enormous weapon firing explosive rounds with wild inaccuracy. Still, the assault forced Xin to withdraw and allowed Urgot to scramble to safety. Before he vanished into the bushes, he turned to the Demacians. "Ya'll ain't see the last a me... You can count on that." Garen rose, grabbing his sword. His wounds had already healed. He wasn't sure why they began to heal so rapidly exactly seven seconds after he stopped fighting, but he wasn't about to complain. He dove at Tristana, carving through her stupid wooden gun with ease. Xin had rejoined the assault, stabbing into the Megling Gunner twice before launching her into the sky. Garen reeled his sword back and swung, tearing through her like a murderous baseball player. As her lifeless body ended its flight by slamming into a tree, the two Demacian champions shared a wicked high five. "Pro status!" they shouted in unison. From behind them, Garen heard the easily-recognizable sound of Mordekaiser's heavy boots sloshing through the river. He thought about his encounter with Urgot suddenly, and he felt a flare of anger deep within him. "Where the hell were you, Morde?" "Do you have any idea how hard it is to wade through a river wearing this?" he said, slamming an iron hand against his armor. "I thought I told you to buy some god****ed boots?" "Don't yell at me, Garen." Morde said. "I didn't have time to go back to the store." "You didn't have time because you didn't have any ****ing boots! Buy them first next time!" Morde scowled at Garen, and he could tell he was hurt. "I'm going back top." he said, balling his fists. "I don't care if you join me." Xin watched Morde leave, and tabbed the back of his hand against Garen's arm. "Are you feeling alright? You know Morde doesn't move that fast." Garen swore, "No, I'm not ****ing feeling alright. You know what? I'm taking center now. DO YOU HEAR ME? I'M TAKING ****ING CENTER!" From far off, he head Teemo sputter an apology, which only made him angrier. Xin regarded Garen strangely for a moment, "Uh... Yeah, okay. I'll be south. Try to calm d--" Xin stopped as he caught Garen's glare, put his hands up, and left to help Anivia. Okay I'm gonna stop here 'cause I just realized how much I wrote. Sorry they only ****ed once, guys. Renekton Bot: author of the sexier Illiad.